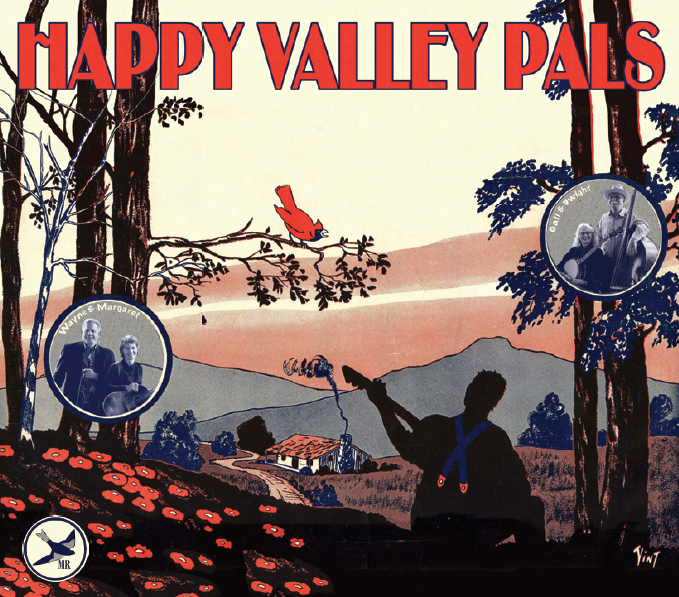 We are pleased to announce the 2015 release of our new album, Happy Valley Pals. To order, inquire at jardown@gmail.com. Purchase price $15.00, includes shipping. Musicians Rich Hartness and Tolly Tollefson live in Greensboro, NC. Both are outstanding fiddlers; Rich is also a great guitar player and Tolly seems to be able to play anything with strings, including ukulele, bass and guitar. Apart from their musical abilities, Rich and Tolly have earned the love and respect of many for their support of friends and colleagues in the old-time music community. Margaret and I traveled to Calhoun, Georgia with Rich and Tolly to perform at the 2008 International String Band Festival, which was organized by Patti Champion-Garner, Paul Shoffner and others to honor the legacy of local musical legends the Georgia Yellow Hammers and Andrew and Jim Baxter. We performed a number of pieces that we had learned from 78s recorded by these musicians, including “G Rag.” Our recording of this tune is part of a larger documentation project organized by Rich and features Tolly on ukulele, Rich on guitar, Margaret on banjo and myself on fiddle. It was a sweet experience for me to participate in the International String Band Festival because I spent much of my early childhood about sixty miles south of Calhoun in Dunwoody, Georgia. I would on occasion visit my Aunt Georgia and Uncle Dewey Stringer. Uncle Dewey kept a banjo and fiddle at the house, and I learned that he had played in a band. Later, after I moved to North Carolina and became interested in fiddling, I returned to Georgia and paid Uncle Dewey a visit. He told me that his stringband was named the North Georgia Buggy Riders and that the fiddle he played had belonged to my great-grandfather, Marcellus Douglas Eidson. Toward the very end of his life, I would call Uncle Dewey on the phone to keep in touch. He never called but would write me letters. When he passed away his daughter contacted me to say that he requested that my great-grandfather’s fiddle be given to me. 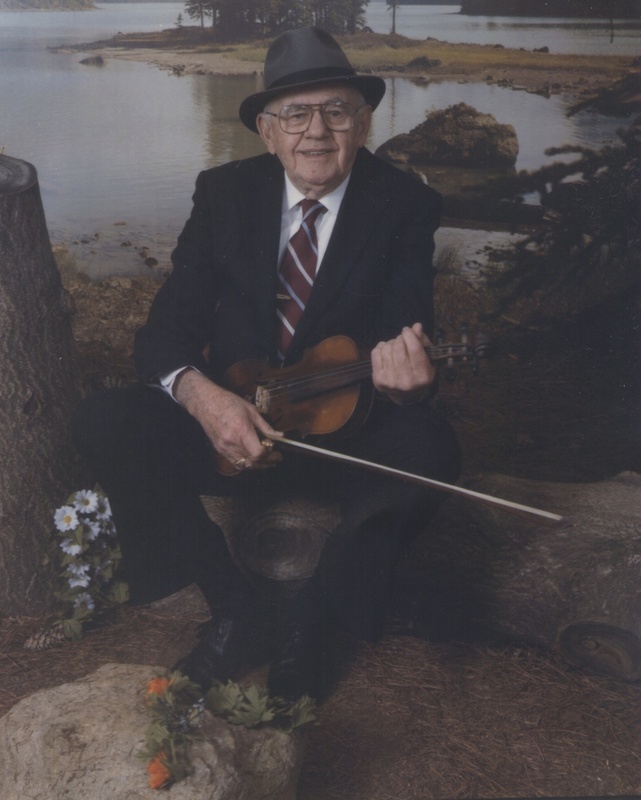 I treasure that instrument because of its association with Uncle Dewey and because my grandmother, Mae Eidson Martin, related to me that her father, Marcellus, would take her and the fiddle with him when he drove his wagon into Atlanta to sell vegetables. After he set up, he would bring the fiddle out, play a lively dance tune, and have my grandmother flatfoot in order to draw customers. When Rich, Tolly, Margaret and I played together in Calhoun, we went by the name New North Georgia Buggy Riders in honor of Uncle Dewey. The name stuck and so did those north Georgia tunes. Whenever the Buggy Riders get together, we jar down on some of our favorites, especially “G Rag,” “Georgia Stomp,” “Forty Drops” and “Bamalong Blues.” For me, Georgia fiddling combines exuberance mixed with the blues and often conveys joy, humor and unpretentiousness. It reminds me of friends and family, past and present, who possess these qualities. Gary Poe, a native of western North Carolina, has a deep and extensive knowledge of music traditions in the Blue Ridge and I was excited when he offered to take me to meet one of his favorite singers, Dorothy Hess. We made our way to her home not far from Jefferson, North Carolina and had a wonderful afternoon of singing and playing music. In this meeting and through return visits I learned that Dorothy is a very determined person who has overcome many challenges. She was born with a disability that affected her legs and she was sent to a children’s hospital in Richmond, Virginia for extended periods in order to treat the disease. 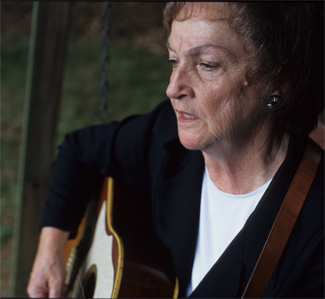 While at the hospital, she would stay connected to her family and home near Lebanon, Virginia by singing the ballads and folksongs that her mother had taught her as a youngster. She learned to play the guitar from her older sister and even performed some on radio with her sisters and mother. Her performance of “Drunkard’s Dream,” learned from her mother, features her strong, clear and expressive voice. There is not a singer around who moves me more than Dorothy. 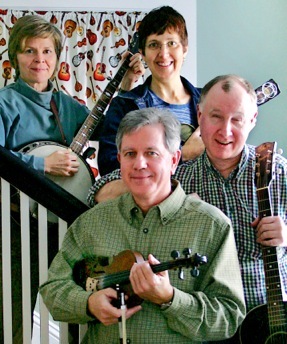 In addition to singing, Dorothy enjoys playing the guitar with old-time fiddlers. I love the way she uses her right hand when playing accompaniment. She plays with a thumbpick and brushes with her fingers, producing a sound that is very steady yet uncluttered. Also, she likes to play at a pace that allows the fiddler to utilize more intricate bowing that can make a tune more graceful. This style of fiddle and guitar playing does not generally win prizes at fiddlers’ conventions but it is one of my favorite ways to hear the older tunes rendered. Dorothy now resides in Wilkes County, North Carolina. You can read a transcribed interview with her in the guidebook, Blue Ridge Music Trails of North Carolina. 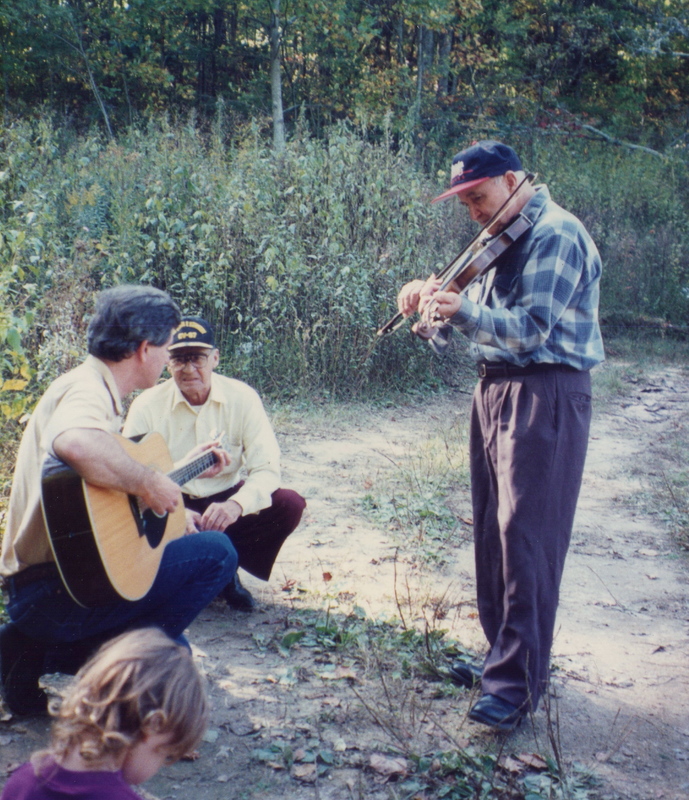 Doug played the fiddle and sang almost every day and used music as a way to stay connected to family members past and present. I was quite impressed when he told me that he arose between 4:00 and 5:00 am. and went to bed not long after the sun went down. If he did not fall asleep after retiring, Doug said he would often lie in bed singing the old love songs. Though Doug never married, he often spoke of love and had strong emotions around the meaning of “true love” and “false true love.” For Doug, the song “Pretty Fair Miss in a Garden” expressed the ideal of true love. 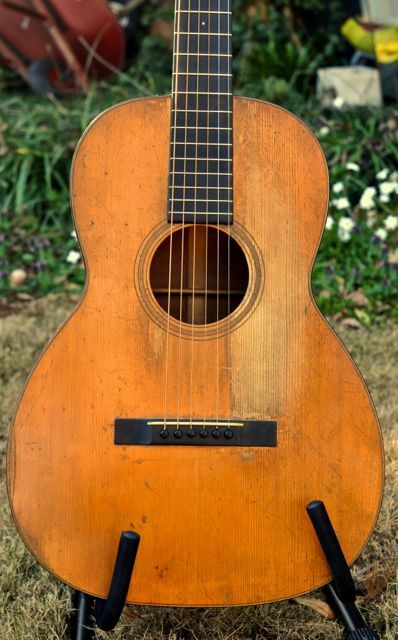 It irritated him that ballad collector Cecil Sharp, who visited Doug’s family during the time of the first World War, referred to the song as “The Broken Token.” Doug insisted that Sharp’s name for the ballad gave the wrong impression that the lovers had not stayed true to one another. Interestingly, though he had heard the song growing up (his great-aunt, Mary Sands, had sung a similar version for Sharp), Doug had not learned the last verse from local singers. In fact, he added it to his version after hearing it sung on a Chicago radio station in the 1930s or early 40s by a performer known as “Grandpappy Nerit.” Through Steve Green and John Harrod, I learned that Grandpappy Nerit was actually Ballard Taylor and that his radio persona belied the fact that he was a young man while performing in Chicago. I was even more surprised to hear that Taylor was alive and retired in Kentucky. I immediately called him and learned that he was born and raised in Ashe County, North Carolina and as a young man toured as a banjo player with legendary fiddler and singer G.B. Grayson. Although he did not recall how he had learned “Pretty Miss in a Garden,” Taylor was pleased that his performance of the ballad was still remembered. This recording was made at Doug’s house in the community of Sodom in 1992 and was a project undertaken by George Holt, myself and Beverly Patterson, with the assistance of documentary photographer Rob Amberg. See the Smithsonian Folkways recording “Doug and Jack Wallin” for this and more recordings that are an outcome of this effort. Happy Valley is part of the Upper Yadkin River watershed in Caldwell and Wilkes counties in North Carolina. Margaret and I have spent many joyful days taking in the beauty of the landscapes there and getting to know the residents, many of whom have deep cultural ties to the land and have retained as strong sense of self-sufficiency. Back home in Raleigh, we often think about Happy Valley and it has become a metaphor for a lifestyle that is focused on attention to life’s necessities and more connected to the natural world. 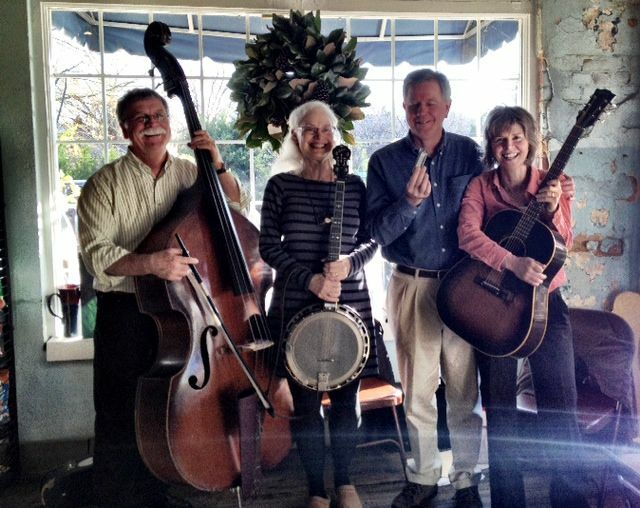 Margaret and I are pleased to share the Happy Valley “state of mind” with Dwight Rogers and Gail Gillespie–wonderful musicians who for decades have encouraged and connected those of us who love old-time music. When we get together, the Pals mainly play tunes and songs that come from North Carolina, Georgia and Tennessee, states where we have lived or have family roots. The pieces presented here are “Shear ‘Em” and “Ramshackle Shack.” Fiddlers Herman Padgett and Jess Albertson from eastern North Carolina inspired me to learn “Shear ‘Em.” In their home communities this piece was the quintessential square dance tune. Margaret’s timing on her J-45, Gail’s great finger-picking and Dwight’s bowed bass constitute a fiddler’s dream rhythm section! “Ramshackle Shack” is from Wade Mainer, who first recorded it in 1937. Our version is inspired by the music Wade made later in his life when his accompanists were often musicians whose playing styles were hard to differentiate as either old-time or early days of bluegrass. In fact, they were neither and both! I love Gail’s and Margaret’s singing on this performance.